로쉬 하샤나에는 빵 부스러기를 물 위에 던지고, 숫양의 뿔로 나팔을 불며, 하나님의 거룩함에 대한 응답으로 회개의 기도를 드린다. 로쉬하샤나의 전통은 ‘레위기’에서 기원하다. 하나님께서는 그의 무한한 지혜와 사랑으로, 그 선택한 백성에게 ‘정한 때’ 또는 ‘거룩한 회합(성회)’을 알리는 달력을 제공한다.(레23:1-2). 로쉬하샤나는 그 중의 하나이다. 놀랍게도 하나님께서 정하신 이 거룩한 날들은 몇 천 년이 지났음에도 불구하고 오늘날까지 유대 백성에게 그 정체성을 제공하고 있다. 로쉬하사나는 성경적으로는 유대 백성에게, 예언적으로는 온 인류에게 위대한 시즌의 시작이다. 이는 또한 구약성경의 여러 곳에서 언급되고 있다. (민29:1-6, 시81:3-4, 느8:1-2) 레위기 23:23-25에서 유대 백성은 거룩한 회합(성회)의 의미로 티쉬레이 달 첫째 날에 쇼파르 나팔을 불도록 지시받고 있다. 그 날은 어떤 일도 해서는 안되며, 오직 주께 번제를 올려야 한다. 성경에 의하면 이 나팔절은 3개의 가을 절기의 첫 번째로서 그 주제는 회개이며 이어지는 두 절기(대속죄일, 장막절)에 대한 준비를 하는 것이다. 많은 믿는 유대인들은 이 각각의 레위기의 성회가 이미 성취되었으며 또 하나님의 회복의 시간에 맞춰 어떤 특정한 사건에 의해 성취될 것이라는 점에 동의한다. 봄의 절기들이 메시아의 초림에 의해 성취되었듯이, 가을의 절기들은 그분의 재림에 의해 성취될 것이라고 믿는다. 가을 절기들은 하나님께서 그의 백성 유대 민족을 잊지 않으셨고, 그 민족 또한 하나님을 잊지 않았음을 온 세상에 기억하게 한다. 전 세계에 있는 유대 민족이 쇼파르를 불 준비를 하고 기도하듯이, 메시아는 그의 백성이 그를 알고 그를 신뢰하기를 고대한다. 가족들이 큰 가지와 나뭇잎으로 덮인 잔가지로 엮어 만든 임시 거처인 장막/초막에서 거함. 이는 출애굽 이후의 광야 생활 동안의 하나님의 보호하심을 기억하기 위함임. 예수님(예수아)은 용서와 하나님의 약속이 현재, 그리고 미래에도 신실하게 지켜질 것이라는 우리의 소망을 구체화하는 분으로 하나님께서 주시고 실행하신 권위로 우리의 ‘왕’이 되십니다. (마태복음 11:27, 요한복음 16:15). 예수님은 대제사장입니다. 속죄제물로서 그의 보혈은 우리의 죄를 깨끗하게 하십니다 (로마서 3:24-26). 대제사장으로써 예수님은 죄가 없이 속죄제를 드리는 자격을 가지면서, 동시에 그 자신이 한번에 그리고 모두를 위한 완전한 속죄제물이 되셨습니다. Olivier Melnick and his wife Ellen serve with Chosen People in Orange County, California. 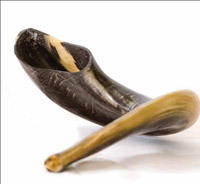 Bread crumbs floating on water, rams’ horns used as trumpets, and prayers of repentance represent responses to God’s holiness on Rosh Hashanah. (Lev. 23:1-2) of which Rosh Hashanah is one. Amazingly, these God-ordained Holy Days still provide identity to the Jewish people today despite the passage of several millennia. laborious work, but present an offering by fire to the Lord. According to Scripture, the Feast of Trumpets is the first of three Fall Feasts. The theme of Rosh Hashanah is repentance in preparation for the other two feasts: Yom Kippur (the Day of Atonement) and Sukkot (the Feast of Tabernacles). The traditional name Rosh Hashanah means “head of the year.” This holy day begins the Jewish civil calendar year and is observed in Tishrei, the seventh month of the biblical Jewish calendar. 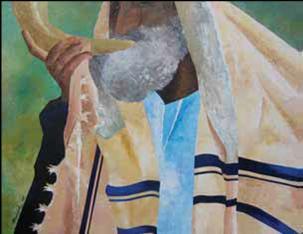 The main command for observance is to blow the shofar, but no reason is given in the Bible. As a result, rabbis have come up with many explanations as to how and when the shofar should be blown. The rabbis believed that there were to be one hundred blasts of the shofar culminating in the final Tekiah Gedolah, meaning “the great blast,” to be held for as long as the blower had breath. Today, some believe this last trumpet blast symbolizes the hope of Israel’s national redemption. On the first day of Rosh Hashanah, Jewish people around the world empty bread crumbs from their pockets into a body of water. Known as Tashlich, meaning “the casting forth,” the tradition is based on Micah 7:18-20, a prophecy that God would cast Israel’s sins into the sea. This also marks the start of the “Ten Days of Awe,” a time of prayer and penitence in reparation for Yom Kippur, the Day of Atonement. Many Messianic believers agree that each of the Levitical holy convocations has been or will be fulfilled by a specific event in the timeline of God’s redemption. As the Spring Festivals were all fulfilled by the First Coming of the Messiah, we believe the Fall Festivals will be fulfilled by His Second Coming. Families live in booths—temporary shelters constructed of boughs and leafy branches—to remind us of God’s protection during the wilderness wandering after the Exodus. Arbat HaMinim (the Four Species): the Etrog (citron, a citrus fruit native to Israel), Lulav (palm branch), Hadas (myrtle branch) and Arava (willowbranch) are used in worship and to bless the booth. With the citron in the left hand, and the others held together in the right, a blessing is recited inside the sukkah (booth) and the items are waved east, south, west, north, up and down as a symbol that God’s presence is everywhere. This practice is based on Leviticus 23:40.
people visiting each other in the sukkah and eating together. John 7 and 8 take place on Sukkot. Yeshua (Jesus) embodies our hope of forgiveness and God’s promise to be faithful to us now and in the future. He is the King through whom the authority of the Father is given and exercised (Matthew 11:27, John 16:15). Jesus is our High Priest. He is the One through whom our redemption is bought through the shedding of His blood as an atoning sacrifice (Romans 3:24-26). As High Priest, Jesus is not only qualified to bring the unblemished sin offering, but is Himself the perfect offering for atonement, once and for all.